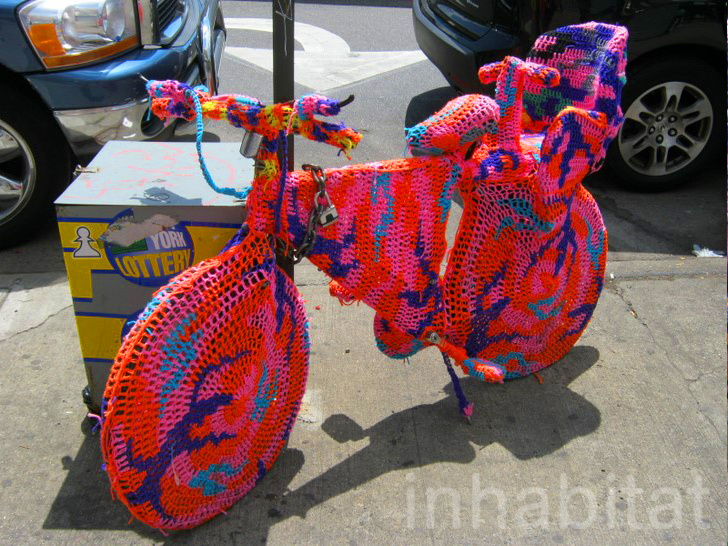 PHOTOS: Olek's Crazy Crocheted "Room" Features Crocheted Bikes, Humans and More! If you think crocheting is meant for old ladies with little to do, think again! An interactive installation now in full swing along the Bowery as part of NYC’s Festival of Ideas, the “Room” by Polish artist Olek is an amazing crocheted world featuring everything from a crocheted bike to a crocheted toilet to even crocheted humans. Jump ahead for the exclusive pics of this colorful feast for the eyes, snapped up by our intrepid reporter Yuka Yoneda — and believe us, no surface was safe from Olek’s colorful crocheting powers! If you think crocheting is meant for old ladies with little to do, think again! An interactive installation now in full swing along the Bowery as part of NYC's Festival of Ideas, the "Room" by Polish artist Olek is an amazing crocheted world featuring everything from a crocheted bike to a crocheted toilet to even crocheted humans. Jump ahead for the exclusive pics of this colorful feast for the eyes, snapped up by our intrepid reporter Yuka Yoneda -- and believe us, no surface was safe from Olek's colorful crocheting powers!